I consider myself incredibly lucky. 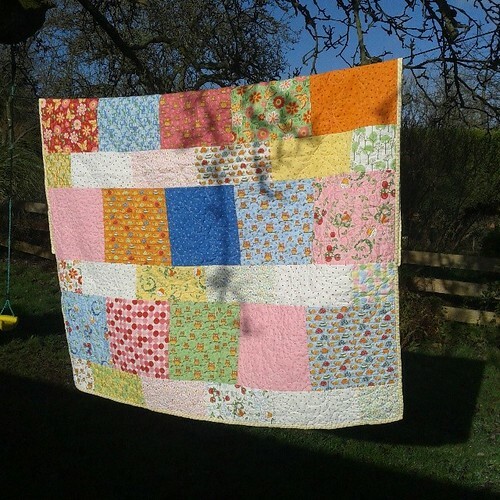 When my little one was around 18 months old, and we moved back to Leicestershire, I was fortunate enough to get the chance to start indulging my need to play with fabric, this led to the discovery of Flickr, blogs and to real life sewing/quilting friends. This community is extremely generous, in the last few weeks I have received some beautiful presents for the baby. 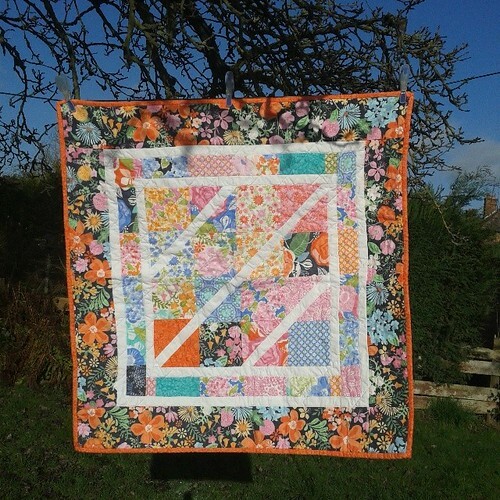 Firstly, the lovely Di was unable to make the most recent East Midlands Modern Quilt Group meeting, so she kindly posted this beautiful baby quilt to me. It is a fabulous quilt, nicely sized for taking with us when we are out and about, and the little one can be popped down for a wriggle on her perfect gift; and when she gets a little older, I am sure she will take the lead from her sister, and use it for picnics with her bears and dolls, which seem to be a constant source of entertainement in our house (maybe it's a commentary on my cooking??!!). And then on Saturday I did a quick visit to the ladies of the EMMQG (we are trying to finish up some of the renovations before the baby arrives so unfortunately I couldn't go for the full day), to check out Kerry's new sewing machine, see what projects everyone was working on (I'm nosey like that! ), and have a little catch up, and lucky I stopped by as the wonderful Trudi had made a lovely (massive) baby quilt as a gift, for us. Wendy is truly the Crafters Apprentice, I don't think there is a craft she hasn't tried, and if there is, it's probably not worth trying! Oh my, just 10 more days? I wish you all the luck and joy f a new baby!!! You are not massive. You make pregnancy look compact! And your new quilts are gorgeous. ha ha ha! ha ha ha ! Summer! Not for us love. Only 10 days to go, so exciting! Though i am a little disappointed you didn't have her on Saturday... wonder if I'll be allergic to the baby too? What lovely quilts! Ooooh, 10 more days, you are nearly there! Good luck with everything! Your (well, her) quilts are lovely! Good luck with the last few days, so exciting! What lovely quilts! Good luck with your last few days - it will be worth it when you meet your new baby. Awww so lovely :) And wow - make the most of these 10 days - sleep now!!!! Hope all goes well and what lovely gifts!